We’re fortunate to live in a modern society with efficient air conditioning. Today, when it’s horrifically hot outside, we aren’t limited to eating ice cream or jumping in the lake; we can enjoy the cool air from the air conditioner to feel better. But while most homes and apartments have air conditioning, people disagree as to which option is preferable: window units or central air conditioning. A central air conditioning unit is easily identifiable by the presence of vents in your home’s walls, floors, or ceilings. A window A/C unit is even easier to locate – simply look for the huge box wedged in your window. Some homes are properly equipped for central air but don’t actually have central A/C units. In such homes, residents must make a key decision: invest in central air, or simply install a window unit. Window units work nicely for tiny apartments with just one or two rooms that need to be cooled. With a larger house, however, they limit your ability to move comfortably from one room to the next. Furthermore, if you live with a large family or have multiple roommates, window units may confine all of you to one or two small rooms rather than let you spread out over the house. You can certainly invest in multiple window units, but only central air can deliver consistent cooling. Central air conditioning increases not only immediate comfort in terms of humidity and temperature, but also the comfort of enjoying your own personal space when you need it. While many of today’s window units boast programmable settings, the ultimate A/C system for programming and regulation remains central air. Smart A/C units are particularly valuable if you’re looking to improve convenience while lowering operating costs. These units actually track your habits and adjust accordingly to best keep you cool and comfortable. Of course, you can still manually program your air conditioning based on when you expect to be home or anticipate needing an extra-cool setting. Window units are notoriously loud. While they’ve come a long way in recent years, they still struggle to compete with the minimal background hum associated with central A/C. If you want a peaceful household no matter the weather, you’ll definitely prefer central air conditioning. 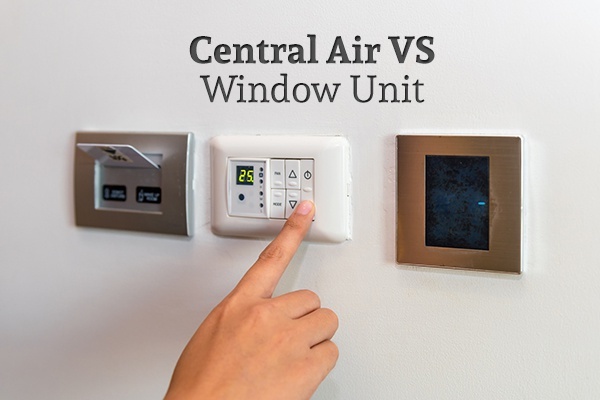 Comparing energy usage between window units and central A/C can be tricky. A lot depends on the size of your home and the quality of your new air conditioning unit. Typically, box units require 1,000 watts to run, while central systems may require 3,500 watts. However, most homes require more than one box unit to actually cool the entire house down. Because of this, a central system generally leads to significant energy savings. Let’s face it: window A/C units are ugly. What’s more, their inherently unattractive nature must be multiplied in most homes, which may have two or three units creating separate eyesores. While aesthetics may not be your primary concern as you choose between window units and central A/C, there’s nothing wrong with appearance factoring into your decision. With central air, you are spared the visual eyesore of an unsightly box sticking out of your window. Central units can be surprisingly discreet – and what’s more, you only need one to cool your entire home. Right now, you want to make the most of your home for yourself and your family. Down the line, however, you might be interested in selling your house. When that time arrives, your lack of central air could be a real liability. Many aspiring homeowners include central A/C on their list of non-negotiables. This is especially true in Texas, where the presence of central air will actively impact the extent to which buyers enjoy their new home. Central air conditioning could be all that’s keeping you from complete comfort this summer. Quiet, efficient, and effective, a central air conditioner can make life more comfortable. If you’re ready to get a central air conditioning unit installed in your home, don’t hesitate to contact Cote’s Mechanical Heating & Air Conditioning today.